@PawsWay helps reduce world tensions with the @WorldStageTO United Nations doggie delegations meeting in February and March 2013. Located at Harbourfront the 3,500 square foot pet paradise has plenty of events and meetups so a daily visit is always recommended - but this world class event by Harbourfront Centre World Stage Production is just hilarious. Photo at top supplied. "Shock, and delight! 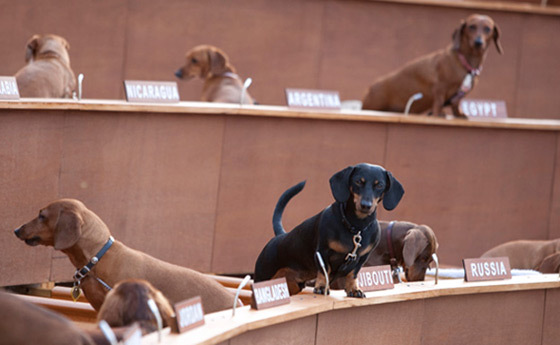 A meeting of the United Nations Commission on Human Rights is staged with the help of specially recruited dachshunds in this wild performance installation. Joyful and chaotic, spectacular and fascinating, Dachshund UN questions our capacity to imagine and achieve a universal system of justice. Admittance to this show is free on a first-come, first-served basis. Performances will also be webcast at PawsWay during the performances." Dachshund UN dates and times: Thursday, February 28th 7pm / Friday, March 1st 7pm / Saturday, March 2nd 2pm / Sunday, March 3rd 2pm. "Dachshund UN is one of 11 groundbreaking international contemporary performance works in the World Stage 2013 season. This year we welcome artists and productions from Canada, Germany, Côte d'Ivoire, Brazil, Australia, China, Norway, Belgium, Portugal and the Netherlands."